Awareness of the non-threatening nature of the extraterrestrial presence will increase. More people will become motivated to seek contact and the certain knowledge that we are not alone. The culture of ridicule surrounding all things ET will diminish so that others who have had contact experiences will feel free to talk. The CE-5 working group leader’s toolkit is under development here. Like the first volume, this book will explore personal contact experiences and how the lives of the people involved were affected. I am looking for people willing to discuss their contact experiences and use their real name in the book. I hope to go more in depth and to begin to answer more questions about the nature of the beings who are contacting us. No writing is required or desired from contributors. All you need to do is agree to let me interview you for as many hours as it takes to record your story on audio, and I’ll take it from there. Contributors will be asked to read the written version in order to make sure it accurately represents what they said, but proofreading for grammar and such is not required (there will be other people to take care of that). There is no set release schedule at this time. We’ll see how it goes once things get rolling. The Authors of the book Paths to Contact are all what we call “contact workers,” and they’re coming to share their personal experiences on April 25, 26, and 27 of 2014. It’s going to be a learning and training adventure. You will listen to the speakers during the day and, for those of you who want to learn more, at night go out to Bottomless Lake to learn how to make contact for yourselves CE-5 style, which means to initiate contact with the ETs yourself as opposed to waiting around passively for one to fly by. People all over the world are now practicing these methods with great success. You can learn these skills and take them with you wherever you go! 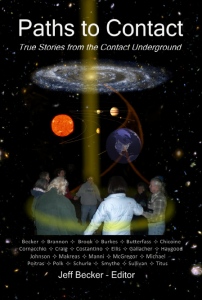 Individuals and small groups have been having amazing human-initiated ET contact (CE-5s) around the world for many years now. It’s time this story got out. Please contribute your story to this book. Please respectfully forward this message to anyone who you think might have a story to contribute. This is the concept: A collection of autobiographical sketches by people with CE-5 experience discussing how they were motivated to make contact, how they learned to do it, some of their more amazing experiences, and how all of this has affected them. I want these autobiographical sketches to explore the human side of contact and to impress upon the reader that all sorts of ordinary folks are doing this, so maybe they can too. The point is not to “prove” that these are valid sightings. It will be more like a collection of “Hidden Truth” type stories from many points of view. The reason for making this a joint effort is the same reason as bringing together many witnesses for the Disclosure Project. Together, we can make a powerful statement. My goal is to make the NY Times best seller list. Each story will be a chapter, approx. 10-25 pages, but that’s just a guideline. If you have more or less to say, that’s okay as long as it is exciting. Anyone considering doing a full book or who has already published all or part of their story in some way, please consider contributing a version of your story to this effort. There will be opportunities in the book and most likely a related website for referencing and promoting your other work. For those who are not writers, not native speakers of English, too busy, etc., but have great stories to share, I will be pulling together a support team. We will conduct interviews, probably via Skype, and then transcribe and edit for you. This will be a non-profit venture. None of the contributors, including myself, will be making money from this. I think that is important for maintaining credibility. I will cover any necessary expenses. All proceeds, if any, will go to a non-profit to be agreed upon by the contributors. I nominate CSETI as my first choice. Details of how this book will be published are to be determined. There will certainly be an eBook version. The publishing market is changing rapidly with Amazon recently jumping into the publishing business, and all options will be considered. “Paths to Contact” is just a working title. The actual title at publication may be different. Contributors will need to use their real names. The time for being shy about this stuff is over. We may even end up doing interviews to promote the book, who knows. Names of people you refer to in your story can be pseudonyms or partial names (e.g., first name only) in order to protect their privacy. If you do refer to someone who is not already a public figure by a recognizable name, be sure to get their permission. This will not be just a collection of sightings such as submitted to Kosta’s email list, although such experiences may be part of an autobiographical sketch. Some people, including myself, may want to discuss some things that happened at Ambassador Training as a part of their story. Those sections of text will need to be submitted to CSETI for approval to publish per signed agreements. I’ll collect those up so I can send them to Debbie Foch in final form in one go instead of dribbling them in. The focus should not be on Ambassador Trainings per se, but rather how this affected you and what you were thinking through the experience. CSETI events you have attended after initial training should be summarized more briefly. Focus instead on the contact you have had individually or in a working group. If you have never been to a CSETI event, that’s perfectly okay. What motivated you to seek ET contact? How did you learn how to make ET contact? Describe some of your most amazing contact experiences (more details below). How did these contact experiences affect you? If you started a working group, discuss why you did it and how the process went. If you started some organization or wrote a book because of your contact experiences, discuss that. When describing contact experiences, please provide a date and general location. Give preference to experiences that are the completely unambiguous: DEFINITELY not a plane, planet, meteor, or satellite. Non-physical experiences are okay, but give preference to non-physical experiences that are validated by a physical experience (e.g., a vision that leads to having contact at a particular time and place such as this one: http://www.contactunderground.com/1… ), or that leads to an important breakthrough in your understanding of the universe. If you have had a sequence of interactions that show you are in communication with an intelligent being, describe the full sequence and what it means to you. If you have seen or talked to a star person, your story is golden. You should tell your story in the first person. Include interesting details as you see fit and make it lively. Generally, the story should be chronological, the same order as you lived it, except where pulling events from different times together as related events in a thread is needed to make a point. Submissions will be edited for spelling, grammar, and length as needed, but we will try to keep your “voice”. If we are lucky enough to have too many submissions, some sort of selection will have to be made. I don’t know what “too many” is right now. Any stories not included in the book may be published on an associated website. If the first book is a hit, a second volume is a possibility. Keep notes on all of your contact experiences! Late in the summer of 2010, I decided to get a decent night vision device and see if I could capture some of the events I was seeing. The results can be found on the Central Indiana CSETI Working Group Vimeo Channel. For those interested in technical details, I used an ATN NVM-14 Gen 3A monocular attached to a Panasonic HDC-TM700 camcorder. It’s a compact unit and reasonably sturdy since it records to SDHC cards. During our September 4, 2010 working group outing, I was trying out this new night vision video gear and caught some interesting events, including a number of streaks, some meteors, a whole sky flash, two “satellites” moving close together, a very big bright flash, and some dark shapes passing overhead which appear to be birds or bats. This video can be viewed here. On Sunday, September 5, 2010, at 11:30 PM I went out on the back porch with my video camera equipped with night vision, held it in my lap and pointed it at the Dolphin constellation and Altair and just held it steady. Although I only saw a couple of flashes at the time, upon examination of the recording it turned out that I had captured a fifteen minute long flash sequence, with flashes every 3 to 4 seconds and moving slowly across the sky. This video is called Repeat Flash and can be viewed here. On, Thursday, September 9, 2010, at 11:30 PM, I went out on the back porch without my video camera and saw a continuation of the flash sequence that I had captured on night vision video Sunday. It started about where the flashes in the video left off, and the craft was traveling in the same direction. It passed behind some thin clouds but continued to flash and move until blocked by some more opaque clouds. I thanked my friends for the beautiful and thoughtful gift. During our working group outing on October 9, 2010, I recorded the amazing sequence of interactive flashes, where Nancy flashed twice with her laser and the ETs flashed back twice. This continued with a variety of flashes, some of which were amazingly bright. I have most of the sequence, except for the beginning, on night vision video. This video is called Double Flash and can be viewed here. On December 14, 2010, I sat inside the sliding glass door on the south side of the house and recorded the Geminids meteor shower. At about 1:20 into the video there is a bright flash – a greeting from a friend. This video can be viewed here.